The Okinawa Prefecture is the southernmost of the Japanese prefectures. It encompasses the southern two-thirds of the Ryukyu Islands archipelago, an island chain that extends south-west from the waters off Kyushu and runs towards Taiwan. In total, this island chain is over 1,000 kilometres long. 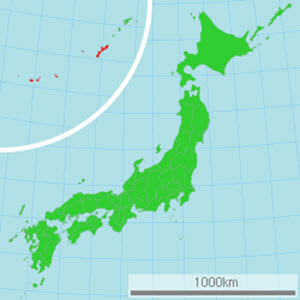 The Okinawa Prefecture comprises just 0.6 percent of Japan’s total land mass. The capital of the prefecture is Naha, a city found on Okinawa Island; the largest island in the Okinawa Islands archipelago. The climate within the prefecture ranges from humid subtropical in the north (e.g Okinawa Island) to tropical rainforest climate in the south (e.g. Iriomote Island). Most Okinawans use mainland Japanese with an Okinawa-accent as their everyday language, and standard Japanese in formal situations, but six surviving Ryukyan languages are still spoken by quite a few people over the age of retirement, and are also preserved in folk music and utilized for a few radio news programs. The Ryukyan languages belong to the Japonic language family, but are generally considered incomprehensible by those who speak mainland Japanese only. Modern homes in Okinawa are typically built from concrete and have barred windows to protect the residents from flowing debris during typhoons. The roofs are also designed to handle the strong winds, and each roof tile is typically cemented on instead of just being layered. Many Okinawa homes have shisas on top. The shisa is a lion-dog statue, and this tradition has its roots among the Chinese guardian lions. In traditional Okinawan mythology, the shisa protects the home. It is common to place a pair of shisa on the rooftop or flanking the gates to the house. One shisa will have an open mouth to scare off evil spirits, while the other shisa keeps the mouth shut to keep good spirits in. Gusuku is a traditional type of fortified Okinawa building. The most significant of them are included in the UNESCO World Heritage List under the entry “Gusuku Sites and Related Properties of the Kingdom of Ryukyu”. Even tough the Okinawa Prefecture is such a small part of the Japanese land mass, about 75% of all United States military personnel in Japan is assigned to this prefecture.